When I started doing inked comic art, I was very cautious in my approach, doing a detailed ink study for every page in the story. Pictured here are some examples of those studies, all done in ink over prints of my pencils on regular copy paper (sometimes scrap). I have since taken this step out of the process, but I still abide by the same principles — I just try to anticipate any problems in the pencil stage. This process was most useful for complicated compositions with multiple subjects. 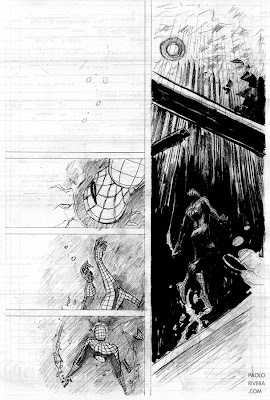 As you can see in some of the simpler panels, the pencils provided enough information to forgo inking. Finally, just a note about my current project, Young Allies: I'm entering the final week of work now — ought to have everything inked by Wednesday, followed by a few days of intense coloring. If all goes according to plan, it should be on shelves in a month. Following that, I will be working on a special project (non-Marvel) which is so awesome, I dare not say what it is. Hey Paolo. Thanks sooo much for posting this . A GREAT insight to your process and a GREAT help to mines. These studies are really great, it's a nice way of training yourself before you begin to attack the boards. I've only started to become comfortable penciling my pages in a way that is suitable for ink. But what I've noticed within my own work is that I tend to simplify the subject matter by choosing not to follow every single line thats on the page. There was a huge discussion within one of my classes between tracing your pencils with ink or straight up drawing in ink. 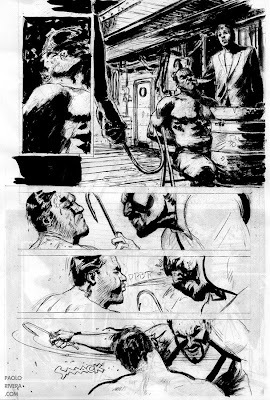 David Mazzucchelli is one of those artists who draw in ink. 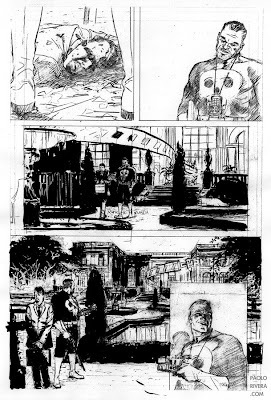 We were so amazed in class by how such little lines he needed to describe a figure with pencil and would leave all the little details in the his inking stage. Inking is a very tough subject matter of which one needs to be confident with the strokes they make. Ink doesn't lie. If you hesitate with a stroke it will show. But Paolo you seem to have a great way of laying down your lines. Not only do you describe objects with certain types of line weights but also with texture, by using a dry brush. Great stuff! Will be on the lookout for the Young Allies. Manny, you're studying with a true master, but you probably already know that. 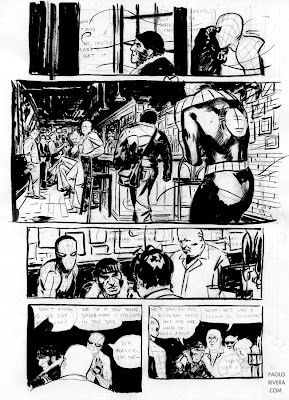 Alex Toth is another one that comes to mind whenever I think about ink. I'm still learning as I go along, but I'm happy to have an audience in the meantime.